In the buildup to national elections on Sunday, the insect has become ubiquitous. Its image adorns banners over busy roads, placards at parades and fliers taped to corrugated steel walls. It is the symbol of the Ethiopian People’s Revolutionary Democratic Front, which has held power in this country for 24 years. A total of 58 parties have fielded candidates for the federal Parliament and regional assemblies this year, and more than 36 million citizens are registered to vote in Sunday’s election, the first national poll since the 2012 death of Prime Minister Meles Zenawi, who ruled the country for 17 years. His party, the E.P.R.D.F., now led by Hailemariam Desalegn, is expected to hold on to power. Politicians from the ruling party have campaigned on a record of economic growth. The economy, according to government statistics, grew 10 percent annually over the past decade. The government has also touted construction of large-scale projects like the Grand Ethiopian Renaissance Dam, which could more than triple electricity generation, and assistance to farmers that helped poverty rates fall from 44 to 30 percent between 2000 and 2011, according to the World Bank. 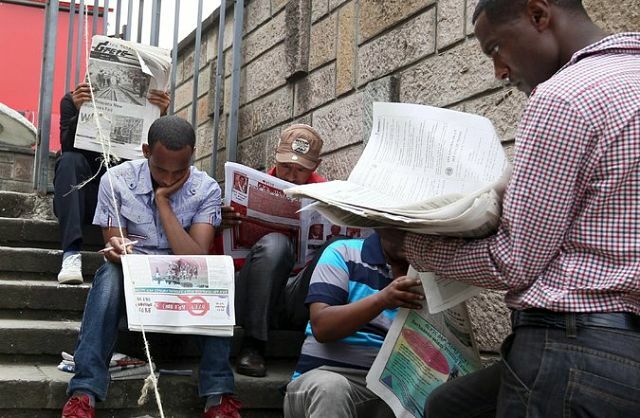 Opposition politicians, meanwhile, have tried to appeal to Ethiopians disillusioned with the ruling party’s tight control over the political sphere, and have campaigned particularly in urban areas. But most voters believe the opposition stands little chance of success given the dominance of the E.P.R.D.F., especially in rural areas where about 80 percent of the population lives.